I made this awesome layout of my son with his bad hair day. He was so mad at daddy. My hubby put too much gel in his hair then crazy haired him. My son hates his hair spiked all crazy. He came running to me with this mad face saying look what daddy did FIX IT! It was too cute. 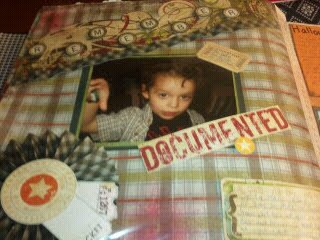 I used the Life Documented kit from Memory Works Simple Stories collection for this layout. super cute layout. create me pink sent me. I am your newest follower. Wow this is adorable!!!! I love your layout you did a great job!!!!! So very cute!! !